You know how the last 60 seconds on the clock of a NBA game can take 18 actual minutes to play through because of time-outs or commercials? Super Time Force is kinda like that, only awesome instead of annoying. Super Time Force is a throwback in more ways than one. Its characters, plot and settings all pay homage to cartoons, action flicks and other pop culture relics from yesteryear. After well-meaning scientist, Commander Repeatski, invents time travel, you control one of an elite squad of time-travel warriors working for his more radical-dude alt-self. The missions you go on are about making the space-time universe "cooler" for Commander Repeatski, like going to the 31st Century to get every browser plug-in ever made so he never has to upgrade. Or making sure dinosaurs don't go extinct be cause he thinks Earth would be more awesome with them around. The tone is goofy throughout, and STF is chock full of references to Back to the Future, Jurassic Park, Mad Max and other films from the 1980s and decades gone by. Keeping in line with the salute to old-school cool, the blocky pixels of STF look like something that could be coming from a Nintendo Entertainment System cartridge. But all this retro styling comes with a new-school twist in the form of a deep time-rewinding mechanic that wouldn't have been possible in 1986. You're throwing your own self back in time. Players get to rewind time with an ability called Time Out. You get 30 Time Outs per level and can spin the timestream back to the moments before you died and call forth new teammates to help you get through whatever killed you. Once you rewind, you can use the special attacks of the Time Forcer you're presently controlling in tandem with those of your now-deceased teammates. If you alter events so that a past self doesn't die, you can absorb their ghost, which also act as another layer of protection, absorbing attacks that would otherwise kill you. Super Time Force takes a lot of cues from Konami's classic 2D shooter Contra, including a masochistic level of difficulty. It's a one-hit-kill affair with lots of enemies looking to do you in. There are standard-issue guys shooting at you, yes. There are also smaller, speedier assailants, bulkier heavy weapons dudes, environmental hazards and rabid pigs, too. The game allots players anywhere from 60 to 120 seconds to kill everything in a level—including boss battles, sometimes. And, even with pick-ups that add to or slow down the clock, that simply isn't enough time, unless you're an elite-level speedrunner. You're always on the clock in STF, making an already daunting game more so. The key to besting STF's challenge is in realizing that you're rarely going to blow through a level in one go. The Time Outs and ghosts selves essentially act as a tiered set of lives. You'll need to make generous use of the Time Out mechanic to essentially build an army of time-snatched selves and blitz through a level. Sometimes, I rewound time all the way back to the start of a level and let my newest self save older ones from things that had already killed me. Yeah, this is grade-A time paradox headache material. Don't think too much about it. 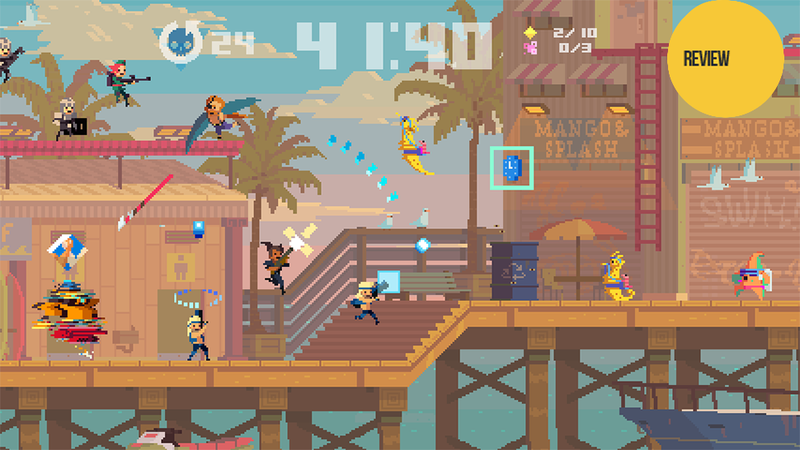 Super Time Force feels a lot more tactical and technically impressive that it initially appears. I only ever witnessed a few instances of slowdown when rewinding and stacking previous actions on top of each other. Nifty little micro-strategies reveal themselves to you as a result of teaming up with yourself. In one level, I replayed the last 10 seconds of a mini-boss battle 15 times, reading the screen and squeezing in new ways to exploit boss patterns every time. Eventually, it dawned on me that I could do stuff like use Jean Rambois' super attack to spray the screen with death, rewind time and bang Jef Leppard's beefier bazooka shots at stronger enemies. Manipulating time in video games isn't a new thing anymore, but the way that STF uses the gimmick feels fresh and clever. Rewinding and playing through a chunk of game over and over creates hectic layers of action. STF feels like a bit of a meta-commentary on speedrunning and the tension between imperfect code and improvisatory input that drives it. If you obsessively go over what you did before again and again, you can earn glowing rewards in the form of contradictory moments of surprising power. Call me pretentious but watching replays of 10, 20, 30 versions of my actions on a screen reminded me of how the splatters on a Jackson Pollock canvas coalesce into a larger beauty. Violent and crazy and fun and profane and thoughtful all at the same time. Now rewind that.